The National Science Foundation's LIGO (Laser Interferometer Gravitational-Wave Observatory) is set to resume its hunt for gravitational waves -- ripples in space and time -- on April 1, after receiving a series of upgrades to its lasers, mirrors, and other components. LIGO -- which consists of twin detectors located in Washington and Louisiana -- now has a combined increase in sensitivity of about 40 percent over its last run, which means that it can survey an even larger volume of space than before for powerful, wave-making events, such as the collisions of black holes. "For this third observational run, we achieved significantly greater improvements to the detectors' sensitivity than we did for the last run," says Peter Fritschel, LIGO's chief detector scientist at MIT. "And with LIGO and Virgo observing together for the next year, we will surely detect many more gravitational waves from the types of sources we've seen so far. We're eager to see new events too, such as a merger of a black hole and a neutron star." In 2015, after LIGO began observing for the first time in an upgraded program called Advanced LIGO, it soon made history by making the first direct detection of gravitational waves. The ripples traveled to Earth from a pair of colliding black holes located 1.3 billion light-years away. For this discovery, three of LIGO's key players -- Caltech's Barry C. Barish, the Ronald and Maxine Linde Professor of Physics, Emeritus, and Kip S. Thorne, the Richard P. Feynman Professor of Theoretical Physics, Emeritus, along with MIT's Rainer Weiss, professor of physics, emeritus -- were awarded the 2017 Nobel Prize in Physics. "With our three detectors now operational at a significantly improved sensitivity, the global LIGO-Virgo detector network will allow more precise triangulation of the sources of gravitational waves," says Jo van den Brand of Nikhef (the Dutch National Institute for Subatomic Physics) and VU University Amsterdam, who is the spokesperson for the Virgo collaboration. "This will be an important step toward our quest for multi-messenger astronomy." A key to achieving this sensitivity involves lasers. Each LIGO installation consists of two long arms that form an L shaped interferometer. Laser beams are shot from the corner of the "L" and bounced off mirrors before traveling back down the arms and recombining. When gravitational waves pass by, they stretch and squeeze space itself, making imperceptibly tiny changes to the distance the laser beams travel and thereby affecting how they recombine. For this next run, the laser power has been doubled to more precisely measure these distance changes, thereby increasing the detectors' sensitivity to gravitational waves. Other upgrades were made to LIGO's mirrors at both locations, with a total of five of eight mirrors being swapped out for better-performing versions. 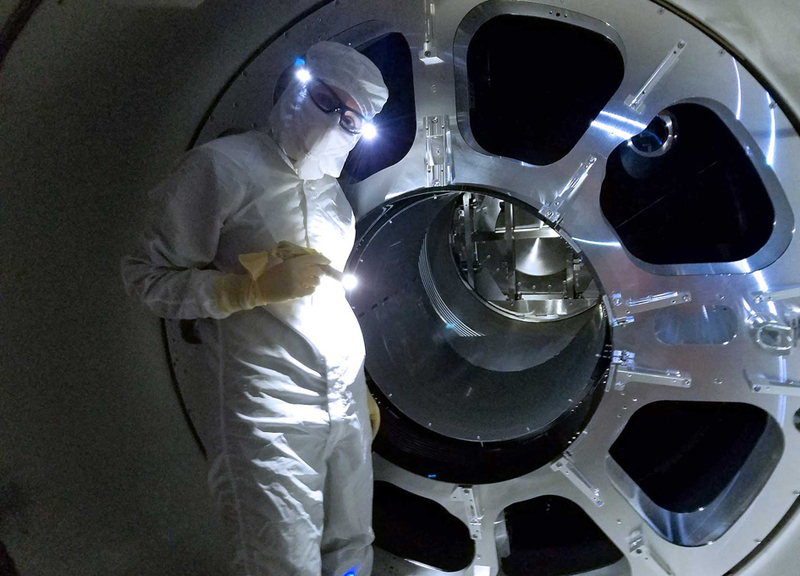 "We had to break the fibers holding the mirrors and very carefully take out the optics and replace them," says Calum Torrie, LIGO's mechanical-optical engineering head at Caltech. "It was an enormous engineering undertaking." This next run also includes upgrades designed to reduce levels of quantum noise. Quantum noise occurs due to random fluctuations of photons, which can lead to uncertainty in the measurements and can mask faint gravitational-wave signals. By employing a technique called "squeezing," initially developed for gravitational-wave detectors at the Australian National University, and matured and routinely used since 2010 at the GEO600 detector, researchers can shift the uncertainty in the photons around, making their amplitudes less certain and their phases, or timing, more certain. The timing of photons is what is crucial for LIGO's ability to detect gravitational waves. Torrie says that the LIGO team has spent months commissioning all of these new systems, making sure everything is aligned and working correctly. "One of the things that is satisfying to us engineers is knowing that all of our upgrades mean that LIGO can now see farther into space to find the most extreme events in our universe." The Virgo Collaboration is currently composed of approximately 350 scientists, engineers, and technicians from about 70 institutes from Belgium, France, Germany, Hungary, Italy, the Netherlands, Poland, and Spain. The European Gravitational Observatory (EGO) hosts the Virgo detector near Pisa in Italy, and is funded by Centre National de la Recherche Scientifique (CNRS) in France, the Istituto Nazionale di Fisica Nucleare (INFN) in Italy, and Nikhef in the Netherlands. A list of the Virgo Collaboration members can be found at http://public.virgo-gw.eu/the-virgo-collaboration. More information is available on the Virgo website at http://www.virgo-gw.eu. \nThe National Science Foundation's LIGO (Laser Interferometer Gravitational-Wave Observatory) is set to resume its hunt for gravitational waves -- ripples in space and time -- on April 1, after receiving a series of upgrades to its lasers, mirrors, and other components.